This mural is based upon Livia's Garden Room at Pompeii which was painted upon the walls in a poorly lit basement area, as with the original the intent was to enliven the walls of a subterranean space. 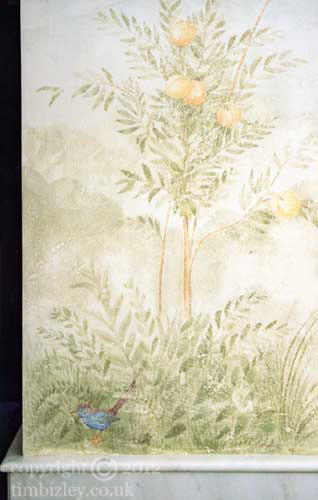 This photo shows the mural abutting marble dado panelling and features detailing of peach trees, foliage, and a songbird. The faded colours and tones of the technique imitate the antique version from which the inspiration for this came.